This article is about the protected area in South Australia. For the associated pastoral lease and wilderness sanctuary, see Arkaroola. Arkaroola Protection Area is a protected area located about 600 km (370 mi) north of the Adelaide city centre in the Australian state of South Australia. It was established in 2012 by the Arkaroola Protection Act 2012 "to provide for the proper management and care of the area; and to prohibit mining activities in the area". The protection area is reported as satisfying the definition of a "category II National Park". The protection area which consists of the majority of the Arkaroola Pastoral Lease and the Mawson Plateau part of the Mount Freeling Pastoral Lease covers an area of about 590 square kilometres (230 square miles). The former of the two leases which has not been stocked for over 30 years is operated for the purpose of conservation and tourism under the name, Arkaroola Wilderness Sanctuary. Following the public outcry that resulted from Marathon Resources' misconduct in the Arkaroola Wilderness Sanctuary—including the illegal dumping of many tonnes of exploration waste in shallow pits, the South Australian government promised to introduce legislation to ban all mining activities in the sanctuary, with the Premier stating that "we have decided to give the region unprecedented protection". The protection enacted by the South Australian government prohibits any and all mining within in an area roughly coincident with the Arkaroola pastoral lease on which the Arkaroola Wilderness Sanctuary is located. 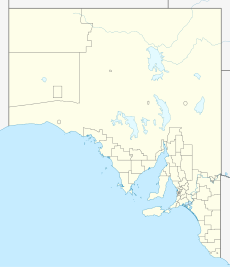 This area includes Mount Gee and the Mount Painter inlier. ^ a b c d "Arkaroola". Department of Environment, Water and Natural Resources. Retrieved 12 May 2015. ^ "Arkaroola". Arkaroola Pty Ltd. Retrieved 28 March 2014. ^ "Map 1 - Arkaroola Protection Area" (PDF). Department of Environment, Water and Natural Resources. Retrieved 12 May 2015. ^ "Arkaroola wilderness mining ban welcomed". 22 Jul 2011. Retrieved 25 Aug 2014. ^ "Arkaroola Protection Act 2012" (PDF). Government of South Australia. 26 Apr 2012. Retrieved 25 Aug 2013. This page was last edited on 11 November 2018, at 02:10 (UTC).